From the company that brought you the stunning bassinet above, Leander now has an equally beautifully designed stool set. Their ergonomic design shifts with the weight of your child and is comfortable for even adults. Simplicity, beauty and functionality reign for this company and they have not failed here. 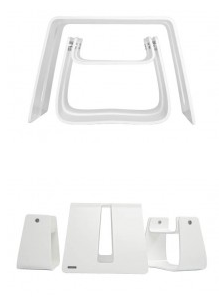 The sets are available in white, walnut and whitewash. The set was designed by Tina Schmidt and developed in cooperation with Stig Leander. Love the bassinet; haven't seen it before! Thanks for sharing.